saving money because their budget is really tough. Many Canadian consumers don’t have any savings and that’s why when an unexpected financial problem arises they need to borrow cash to fix it. We plan our expenses and try to foresee different situations, but life is unpredictable and anything can happen. And that’s why it’s so important to protect yourself from unpleasant surprises and create an emergency fund. These savings will be your helping hand in case of financial emergency and there will be no need to apply to people you know or different lending institutions and ask for financial help. Creation of an emergency fund is a first step on your way to a personal financial independence and it’s very important to make this step wisely. Do you know what can be called a perfect emergency fund? It’s in case your savings are enough to cover your expenses during 3 months. Make some math and count how much money you need to cover your monthly expenses including regular bills, mortgage or rent payments, food, health insurance and other personal expenses. Then multiply this sum for three and that will be a minimum for your emergency fund. Estimate your financial situation and risks of losing a job or other possible troubles and try to define how much you need to feel more comfortable. In case you have enough then you feel calm and can sleep well at night because you’re confident in your ability to fix possible financial problems. It’s completely up to you where to put your savings. But of course, it’s better to put money in a place where it can make some interest so it will bring you an additional profit. You can open a savings account in a bank and it will make your savings work for you. But on the other hand, today’s economic situation is highly unstable and you never know if you can trust to one of another financial institution. So you should choose a place where your money will be absolutely safe. It will be better if this place won’t be easily available for you because there’s a risk that you will try to use some cash until there will appear an important reason for that. 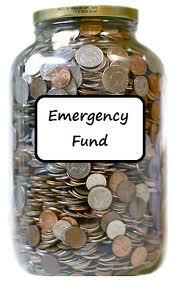 The main goal of the emergency fund is to protect your well-being in completely unexpected situations. Nowadays it’s popular to apply for unsecured loans from places like NorthenLoans.ca or other lending companies in case there’s a need for fast financial assistance, but if you have savings you can easily avoid borrowing and making financial commitments. Remember that and don’t touch your savings unless there’s a real emergency. Also it’s important to understand that emergency isn’t just another casual problem which may arise any day. That’s why it’s important to cherish your efforts and not forget about your real goals.